Marry knowing that it is for love and not money. 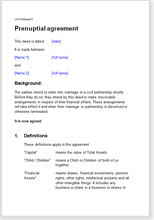 This prenuptial agreement (also known as a pre-marital agreement) allows you to plan how you will divide your current and future wealth between you and your husband, wife or partner should you decide to divorce or separate in the future. It will help you control your ownership of important assets such as your house, sentimental possessions and your business. It is important to understand that the court retains complete discretion to divide the assets in a financial divorce settlement as it likes. Whether you create your prenup yourself, or ask a solicitor or family law expert to do it for you, there is no guarantee that your wishes will be followed exactly. Family Law Act 1995 and Family Law (Divorce) Act 1996 set out what a judge should consider when dividing assets. The principles can be applied differently, and the actual outcome will very much depend on the person judging your case. However, a well written, sensible, pre-nuptial agreement is highly likely to influence a judge's decision.